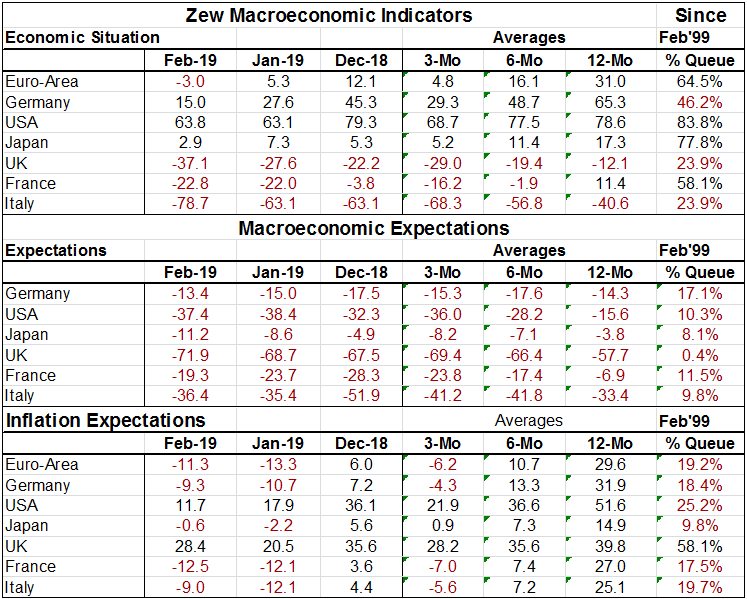 The ZEW financial experts have weakened their assessment of current economic conditions everywhere except for very minor exception in the US. Current conditions placed in their historic queue of values rank highest in the US at a strong 83rd percentile and rank in the 77th percentile in Japan. But they rank in the 64th percentile for EMU and the 46th percentile (below its median) for Germany. The low rankings among the group are in their 23rd percentile for the UK and for Italy. Expectations show monthly improvements in Germany, the US and in France. But hold the Champaign. These are very minor month-to-month improvements that still leave all the ZEW assessments of expectations below a 20th percentile standing. The German standing is in its 17th percentile, the US standing is in its 10th percentile. The UK has been this weak or weaker 0.4 PERCENT of the time – less than one half of one percent of the time. Clearly the ZEW experts still are very worried and wary of the outlook. And, just as clearly, they are not very optimistic about the UK’s prospect for securing "a good" Brexit deal. Not surprisingly inflation is in the bottom 25 percentile of its range or lower everywhere except in the UK (58th percentile) where there is probably concern that a bad Brexit deal could unhinge the pound sterling and lead to a jolt of inflation. But ZEW experts also have inflation expectations at a 25 percentile standing in the US where inflation has nonetheless remained tame. Inflation expectations are clustered just below the 20th percentile mark for most countries with the exception of Japan where it has a 10th percentile standing. Short term interest rate expectations fell sharply everywhere in February with the diffusion reading for the US falling to 23.7 from 58.6 and logging a 42 percentile standing, below its median. This reflects the policy of even-keeling announced by the Fed at its recent policy meeting. The Fed is no longer on a relentless tightening program. Europe and the UK also have a 42 percentile standing for their respective short-term interest rate expectations. Japan has a lower 18 percentile standing. Long term interest rate expectations follow the movement of their short term counterparts rather closely this month. Stock market expectations are at zero or near zero percentile standings for the UK, Italy and France. For the Euro Area as a whole and German they are at their 15th percentile. For the US and Japan they are at their 23rd percentile. None of those are a vote of confidence in the future. These are weak economic conditions. In the US some Fed members continue to see more rate hikes ahead but not for a while. But the political situation in the US is still bad. It is hard to see good things happening for the economy in the face of the kind of opposition the President faces to his policies. In Europe the UK seems to face a similar bleak future. Meanwhile, Europe itself is not doing very well. It is a very difficult time for the global economy. There are no ZEW assessments for China, but growth there is slowing and everyone is waiting to see if the US and China can come to a trade compromise without triggering a new round of much more damaging tariffs. The risk/reward on the future seems to have become much more negative despite a few ZEW upgrades. But the expectations in absolute terms as meted out by the ZEW experts remain dire while the current situation has greatly eroded. There are no rose-colored glasses here.